What is it about Sadya that makes it worth looking forward to?No doubt the fare of Payasams served at the end of the meal.Any Sadya is incomplete without at least one payasam to be devoured after the huge spread.In Kerala,most of the time,the sadya would have 2-3 payasams,at least one of which is Paalada.Growing up,I was not a big payasam fan.Maybe it was my taste buds then,but now give me a good bowl of payasam and I'll be one happy person. 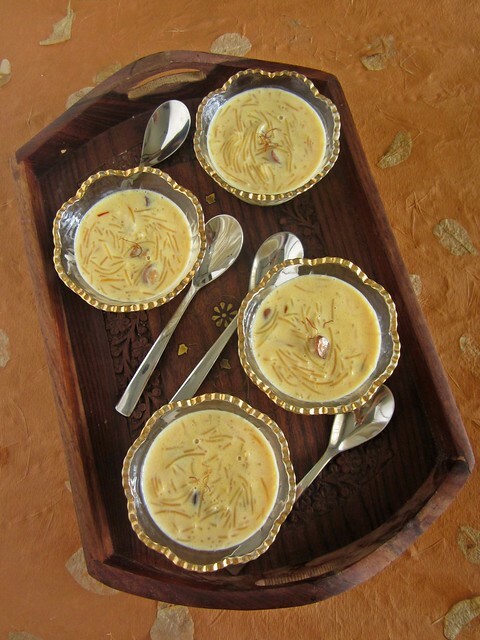 Semiya/Vermicelli payasam is one of the most simple and delicious payasam that one can whip up in no time.A staple dessert when sudden guests stop by for lunch/dinner or to celebrate a joyous occasion in the family,a big batch of semiya payasam fits the bill perfectly.I learnt to make it while in school and still remember the feeling of satisfaction when I tasted the first spoon.It really is that simple,a totally foolproof recipe. 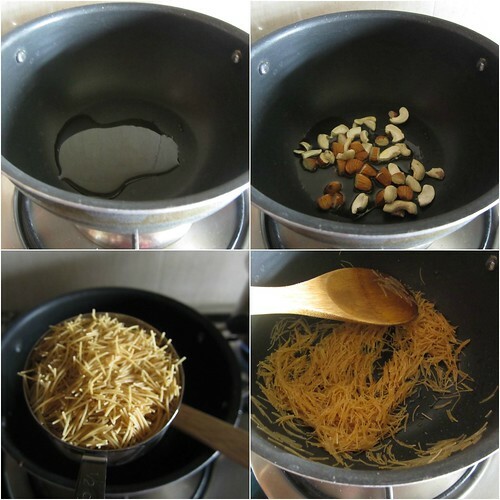 In a deep pan add ghee and roast the nuts till golden brown.Remove and keep aside.In the same pan,roast the vermicelli till it slightly changes in colour. 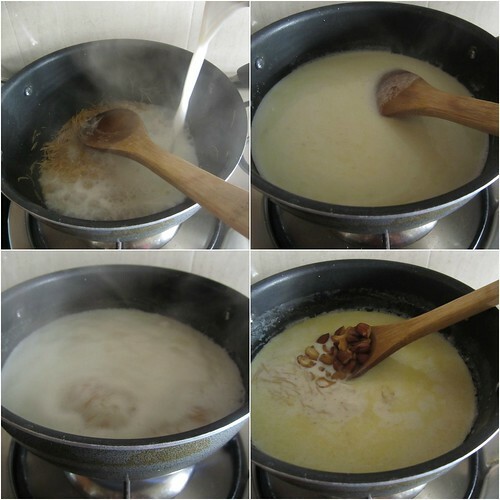 Now mix in the boiled and warm milk and stir well.Let it come to a boil. At this stage add the nuts along with the milk and let it cook or else you could add it during the last stage. Cover and cook for 7-10 minutes or till the semiya is cooked. Mix in the milkmaid and stir well.Add the crushed cardamom and keep stirring. Mix in the saffron soaked in warm milk. Cook for a further 2-3 minutes and then switch off the flame. Garnish with saffron strands and serve warm. I add cardamom as a whole,crushed a little.I feel this adds more flavour to the finished dish.Yo can remove the peels of cardamom before serving.Or if you prefer,add crushed cardamom seeds alone. Adding the nuts while the semiya is cooking makes the nuts soft and delicious.However,if you like some crunch in the nuts,add half in the payasam while cooking and the other half as garnish. 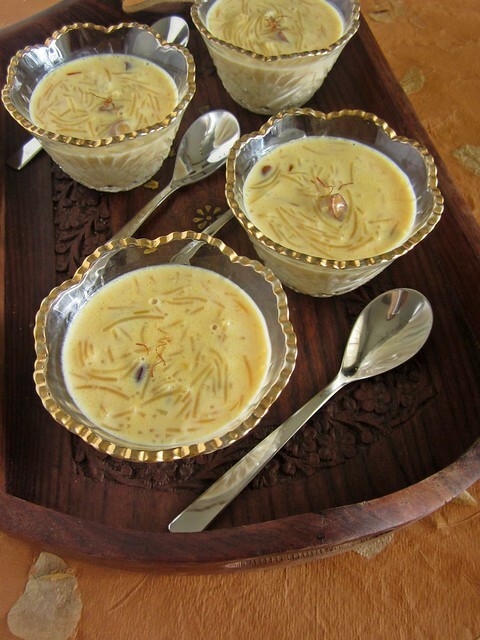 I take the short cut of condensed milk as it is not only easy 2 make but also enhances the richnesss of kheer...looks yumm n nice..
Semiya payasam looks delicious, nice presentation. Good one. V make this at home on rakshabandhan. I just love this one, esp when chilled in for couple of hours. Yumm! 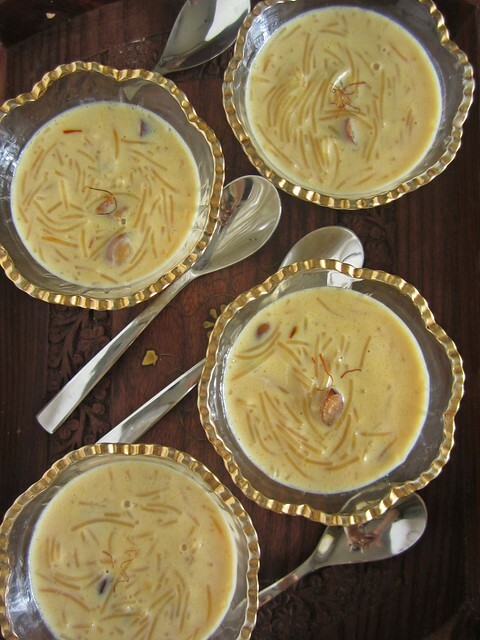 Love the Pal Payasam.... I too add condensed milk to the Pal Payasam...it gives a creamy flavour. 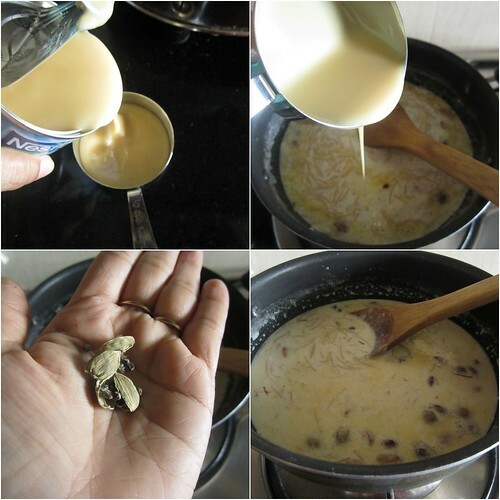 Even i do add condensed milk to payasam, love those bowls..
You got me reminded of the festival! Have to check out the dates !! I love seviya, this looks so gorgeously inviting. Though we eat ours barely sweet, so there'd be no extra sugar added for sure! 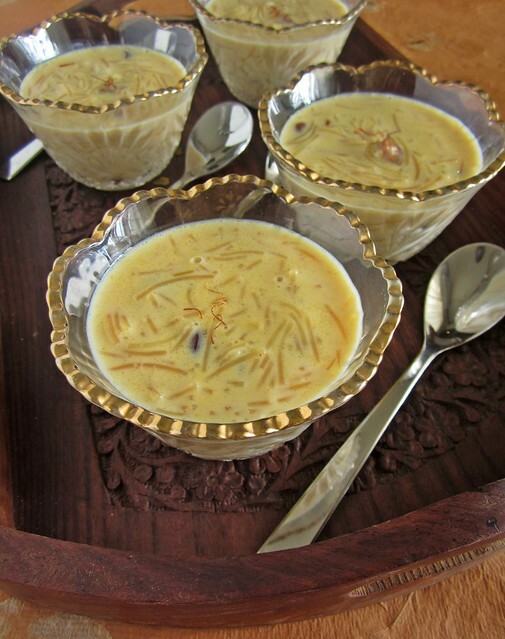 The payasam continues to thicken as it cools down.If it becomes too thick to stir,it means it was switched off while it was quite thick.Try this recipe and I am sure that wouldn't happen. mmmmmmmmmmmmmmm...........real good recipe - only added coconut cream and sago.